This Oak tree was struck by a piece of equipment. The tree is relatively young so, even though the damaged area is a bit large, it should recover quite well. Maybe it’s a careless maneuver with the new lawn mower, or maybe it’s your neighbor who was busy making a phone call while backing out of his driveway. Whatever the cause might be, sometimes our trees can incur trunk damage. Damaged tree bark is not just an aesthetic problem but it can be a pretty serious health issue for your tree. Bark is essentially the skin of the tree. The corky outer layer of a trees bark protect the tree from insects and diseases. When this layer gets knocked off it opens the tree to possible infection and decay that will weaken the main stem and cause significant decline in the trees overall health. Also a very important layer of tissue called Phloem is protected by the tree’s bark. Phloem is part of the tree’s circulatory system and is essential for the trees survival. The Phloem carries the energy rich sugars, produced during photosynthesis, throughout the whole tree. Obviously, when the bark is removed this flow of food is stopped and the damaged part of the tree begins to dry out and decay will soon set in .So…what can you do? If the damaged bark is less than 25% of the trees total diameter (as with the above photo) then the tree should recover from the damage just fine as long as the tree is porperly cared for and remains ,otherwise, healthy. With 25% – 50% of the trees diameter damaged, the tree should still survive but with some serious detriments to the trees health. Even with prompt care you should expect to see some die back in the tree’s canopy. 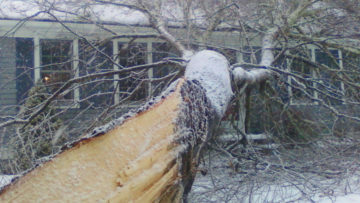 If the damage encompasses more than 50% of the tree’s diameter, there is still a slight chance that the tree could survive but this will require a process called bridge grafting. Grafting is not rocket science but does require some skill and knowledge. 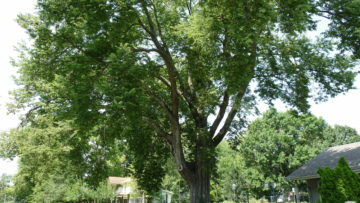 In this case you should call a tree care processional to help you assess the trees condition and determine if the tree is savable. If the piece of bark that has been knocked off of the stem is still relatively intact, then you may be able to reattach it. Place the damaged bark, or bark pieces, back in the same direction and in the same location they were in before they fell off. You will have to fasten these pieces in place using a strap or some other material wrapped around the trunk. Burlap or even Duct tape will work just fine. This wrap will have to stay in place for at least 3 months so make sure you tie it on securely. This approach will only work if you still have the pieces of bark mostly intact and if you do this very soon after the damage was inflicted. The cambium layer below the bark should continue to grow and fuse the damaged Phloem back together within a few months. Using a clean, sharp chisel, cut away any jagged and lose edges from the wound. If the bark is crushed or broken into pieces that are smaller than can be reattached then you will have to help the wound to heal as cleanly as possible. Jagged edges around the wound will hinder the tree’s ability to grow the callus wood needed to cover over the exposed wood. 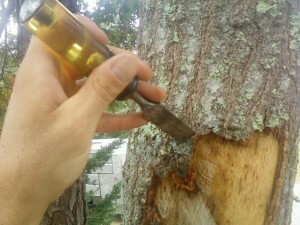 Also jagged and torn edges can potentially continue to rip, causing more damage to the tree’s trunk. You will need a clean, sharp chisel and a hammer for this job. Begin cutting a clean, straight edge aground the wound. Do not leave any sharp angled corners but rather trace out a rounded and even shaped edge around the wound. Make sure your lines are straight. Of coarse, you should be careful to not cut any deeper than the bark. You should not drive your chisel into the wood of the tree and so this will take an easy touch with the hammer. Bark tracing like this gives the tree a much needed advantage. New callus wood tends to grow much easier and more evenly from a clean cut wound than from a jagged wound. In this way, trees are similar to us. Again, make sure your corners are clean and rounded, not leaving any lose and torn bark behind. Keep your lines straight and continue cutting all the way around the wounded section of trunk. Notice the clean rounded edges of the wound. This will help the new callus wood to grow more efficiently. Do Not Use Tree Paint! For years, arborists had a practice of painting a tar based paint on tree wounds. This was thought to keep insects and diseases out and moister in. Many studies over the past years have shown these products to not be useful. Tree paint does not, in fact, keep insects or other pathogens out of the tree. Tree paint does not help the callus wood to grow. Ironically, it has actually been proven that many of the tree paint and tar products on the market actually detract from tree health by introducing harmful chemicals into the tree’s biology. It is best to let the tree’s natural defense mechanisms wall off any decay that might try to set into the wound. Arborists have discontinued the practice of using tree paint, but oddly enough it is still sold in many garden centers and hardware stores. So, again; DO NOT USE TREE PAINT!